This layout I created 2 years ago, it was accepted for published and then all sorts of publishing drama has occured. I have been advised it may not be printed and I can share it so here it is…. I decided to have another go at this challenge this month. Last month the Custard Yellow layout I did was pick up for publishing so I was keen to get an entry into this challenge. The colour this month was Antique Moss. Kahki Green in other words. All my greens are fairyly bright so I started off mixing my own version of the green that I wanted to use. 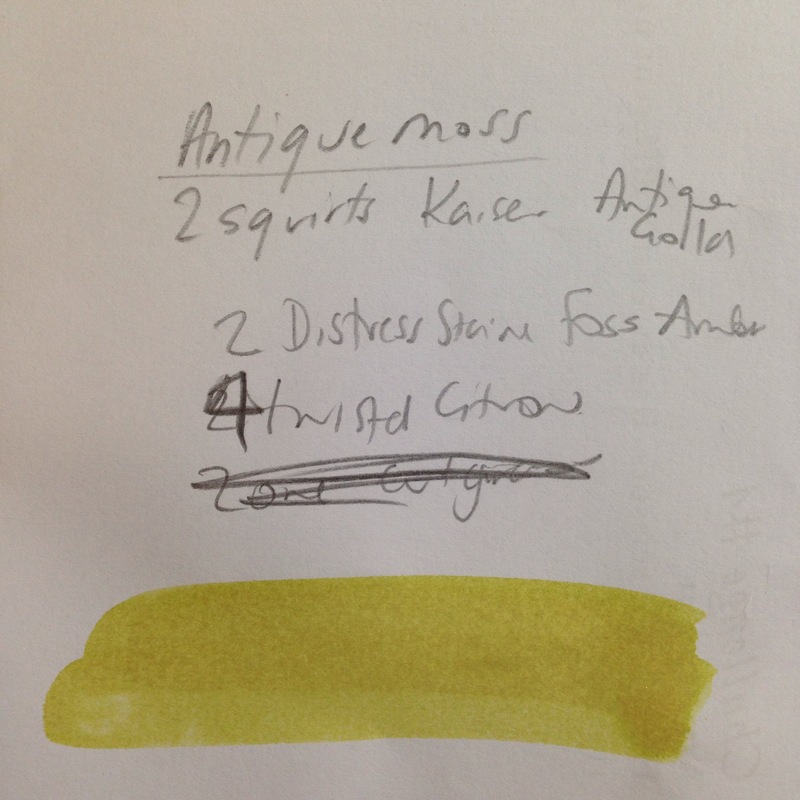 My ingredients were – 2 squirts of Kaisercraft Antique Gold, 2 Squirts of Tim Holtz Distress Stain in Fossilised Amber and 4 of Tim Holtz Twisted Citron. This is my colour swatch. I knew I wanted to write this blog post to I made sure I kept track of what I was adding. I applied my ink to my pre-prepared cardstock (a layer of gel medium) using a mop brush and plenty of water. Once it was dry I added some texture paste through a sencil. I then went through my stash and pulled out everything that was white and green. I had no idea where I was actually going with this layout but I knew what colours I had to work with. I found this little felt frame in a box of ‘I don’t know if I will ever use these things’ and I decided that I was going to make it work. The photo I chose was a black and white photo of my daughter that I had printed out a while ago but hadn’t decided how I wanted to scrap it. I actually have a few different photos from this day that I want to scrapbook but I love them so much I didn’t want to just scrap them for the sake of it. Anyways, once I had my frame and my photo I just kept layout out bits and pieces until I was happy then I glued it all down. Just as I was sitting down one night to write this post I thought I should send this one off to see if I can get it published. I was gobsmacked when I got the acceptance email. So now it has been published I can finally share it. This year I am privileged to be continuing on with Flutterby Designs as a member of the Design Team. And here is my first Layout for the year. This is capturing the 80’s dress up night from last years Scrap and Chat Retreat in Melbourne. I am currently counting down to this years one…I can’t wait! To read all the details – Please head over to the Flutterby Blog and leave some love. 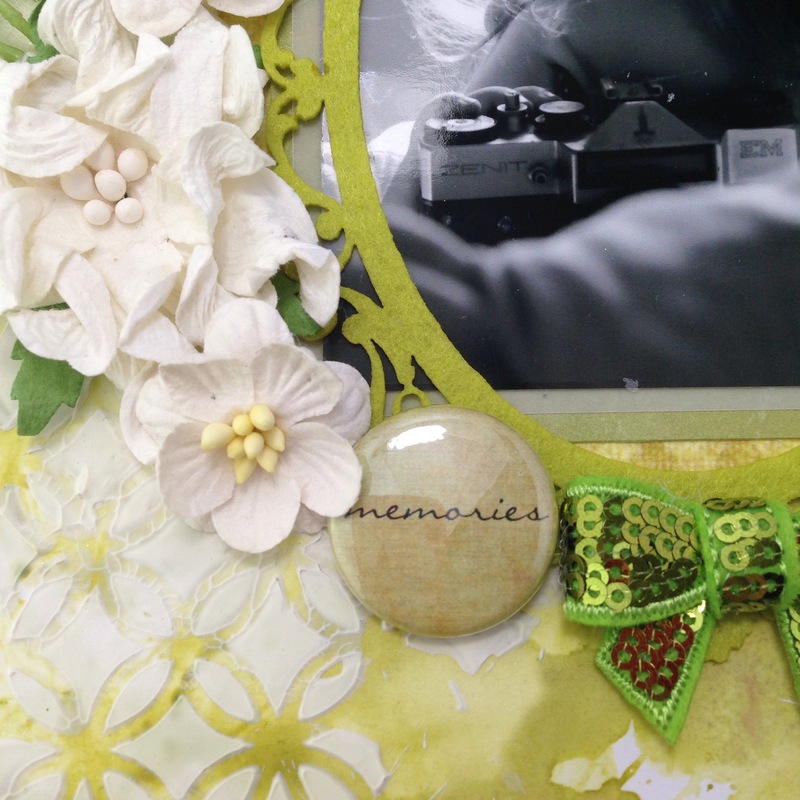 Final Masters Challenge – Scrapbooking Memories. Today it’s just a quick share. 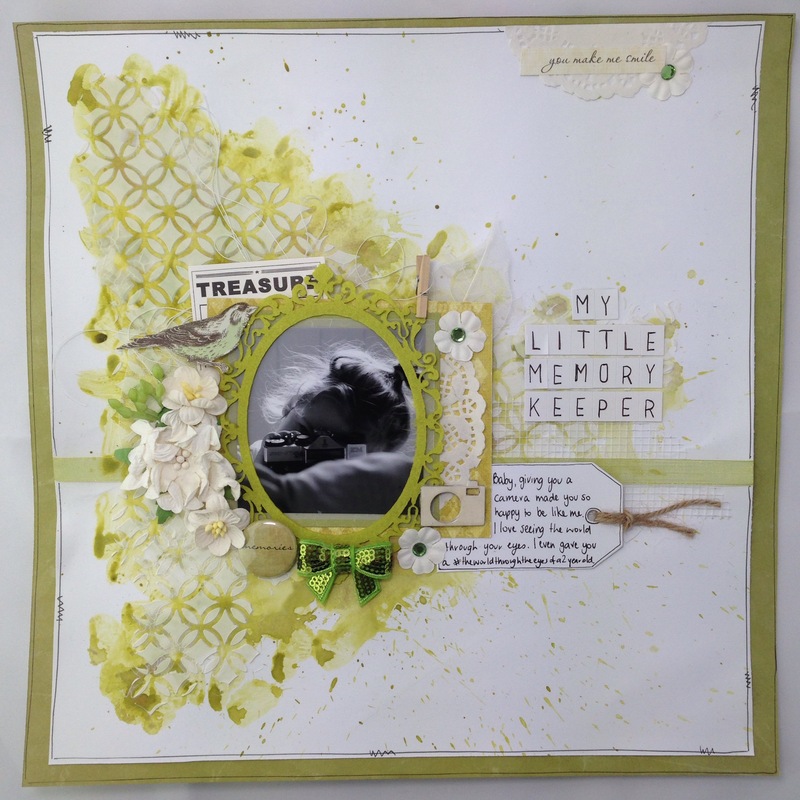 This is my final Scrapbooking Memories Masters Challenge submission. Clearly not my best work. Submitted late and in actual fact the challenge pack still to this day has not arrived. I was and still am so disappointed to the way this experience has ended. But enough about that… Here is my layout. This one uses the Love Always Collection from CocoaVanillaStudio as my base and then I have layered some mixed media over the top. There is texture paste, gelatos, gyprock tape, and then thread, washi tape and hand coloured doilies. The challenge was to use Fiskars punches (which didn’t arrive) I I used a circle punch and a heard punch. The layout is a little bit cute at the end of the day but I want wanting to work on some new stuff. The Colour Blast Embossing powder looks amazing on the chipboard title from Which Craft do you do. And the Charms Creations X goes fantastically with the Flutterby Designs flair. What isn’t to be happy about really?!? Posted on November 18, 2016 October 21, 2016 Categories Charms Creations, Colour Blast, Craft, Crafts and DIY, D-lish Scraps, Design Team, Flutterby Designs, ME, Mixed Media, Scrapbooking Memories MasterTags Art Meets Memories, artsandcraft, Colour Blast, craft, crafter, creating, creativity, documenting, layout, Mixed Media, paper, papercraft, scrapbook, scrapbooker, Scrapbooking, scrapbooking layout, scrapbookingchallenge, scrapbooklayout, scrapping, youtubeLeave a comment on Final Masters Challenge – Scrapbooking Memories. I am just popping in to share my layouts created for the Scrapbooking Top 50 Block Challenge for Week 4. This week it’s Kitchen week. Both the kitchen inspiration boards are very different and not your typical kitchen so there is a lot to be inspired by. I chose to work with Kraft as my base to reflect the wood element from the moodboard and I kept all my wood veneers raw also. For my leave element I used some material leaves and also some hand stamped ones. I stamped them both on plain white paper and book paper to give some details before colouring them with watercolours and Colour Blast Shimmer Dust in Lush and Paris. To the background I added heaps of texture behind the hoop. I used a real doily as a stencil to spread on some texture paste. I then coloured the texture paste with the same colours I used for the leaves. Behind all that, I clear gessoed a brick stencil and when it was dry I inked over that too. This makes the bricks stand out. Over the top of all this I added some script stamp and a brick stamp from Viva Las VegaStamps. For the dip-dyed elememt, I included a dip dyed tag from D-lish Scraps that I trimmed down to be a similar size to the leaves. I also coloured a Charms Creation heart in a similar way and a Flutterby Designs DIY Flair. These are pretty cool. I need to use them more. Oh, and I almost forgot, the hanging element is the suede tassels. I am really happy with the way this one turned out. I guess you can tell by the way I wanted to tell you about nearly every element on the page. Here are a few close ups. There is a process video too. You can watch it here. I was a bit disappointed that it was about Triangles again. The first challenge had triangles. I guess they didn’t have to be used on that challenge but I did. So, I used the same stamps from week one that I made and clear embossed them then coloured them with a wash of water colour. To change it up a bit I also added triangles of coloured paper scraps too. It’s a fairly simple layout for me but to be honest, I have had these photos printed for a long time waiting for the right layout and finally, here it is. The criteria is pretty easy to see, Triangles, Mixed alphas and small photos. There is a process video for this one too. You can watch it here.